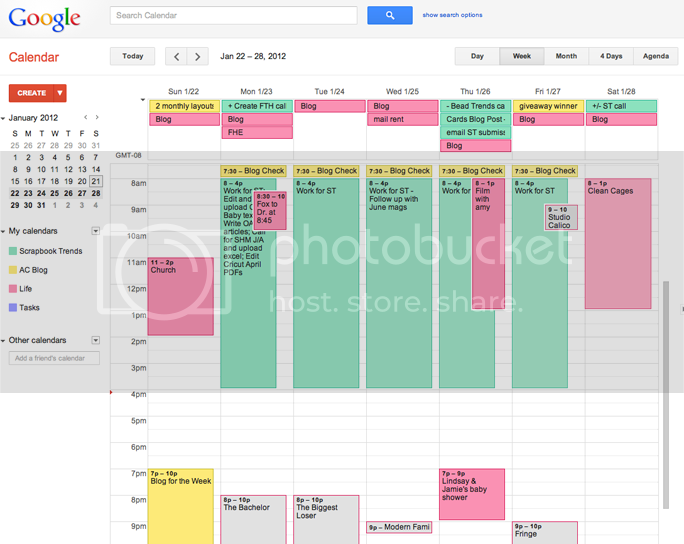 Google Calendar is my lifesaver. I used to use Franklin Covey day planners, but they were expensive and now that everything is digital I've come to love and majorly depend on this - no pens or pencils or erasers needed, AND I can change and update it on the go from my phone! This week is filled with work, work, and more work, a Dr. appointment for Fox, a double baby shower (there are soooo many babies being born around here this year - as always! ), the latest and greatest Studio Calico reveal, blogging daily, lots of great TV, paying rent, and so.much.more. Just another typical week in this stay-at-home-working-mom's life! PS - It was exactly 8 years ago to the day that I met my eternal companion! Read our story as told from Chris' perspective HERE. Happy 8th Meetiversary Chris! Best 8 years of my life. I love you! today published a page on my blog, this page is a lift of a layout your, is a page that I love! I hope you do not get mad at me ... lol. cute and fun. my days used to work with the calendars too but then the stupid computer stopped syncing with my phone so some of my day is on the comp, some of it's on the phone..weirddddd. i love the meeting story! so cute! I have come to love Google Calandar as well this past few months. And we have it linked between mine and my (almost) husbands phone - so we can both add and update it!! its great!! 8 years - congrats on that, its almost 11 of dating my (almost) husband!! SCARY it has gone so quick!! Got to love Google calendar! I think my fav thing is sharing a family calendar with my husband. Everything is all in one place and we can update from phones of computers. I love when you share posts like this--It's super fun to get to know my blog friends! Your schedule looks SUPER full! I'll have to check out this google calendar program! Looks so much easier than paper/pencil--and I LOVE that you can change it on your phone! FAB! Love seeing a peek into your daily life, and had to lol at the TV list at the bottom. I guess it's a good way to remember the shows you don't want to forget! Oh gosh, I NEED to try this. Remembering everything just in my noggin hasn't cut it lately!